One Social Bookmark Replaces All. ~ The Blog Doctor. 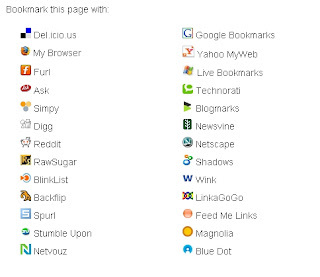 You are here: Home > social bookmarks > One Social Bookmark Replaces All. One Social Bookmark Replaces All. 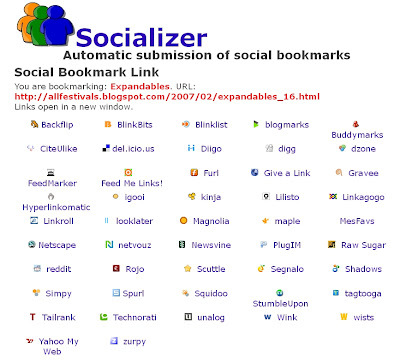 Social Bookmarking sites are important for several reasons. They serve to store your Browser bookmarks so that you can access them from different PCs and also to share them with like interest people. These sites are frequently crawled by search engine bots and have a higher Page Rank. Hence if your blog has a link on one of theses sites it will get indexed by search engines faster. Substitute actual blog name in place of yourblogname. Also choose whether you want to add it to a blog or a website and choose platform as Blogger or Wordpress or other. Then click Get Your Free Button and you will get the code. Copy that code. 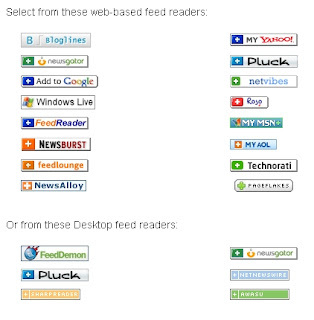 This is another site which offers a combination of social bookmarks. First download the images above the Socializer heading to your PC. You can download either the big or the small icon. Just right click the images and choose Save Image. Then upload these images to a freehost like Googlepages and copy down their link location. I followed your tips. I have the blogger advanced template. I got an error message saying the words pub url and title must have the ';' delimter. So I inserted the colon signs in those spots and it worked.